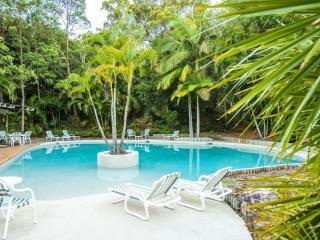 Rainbow Beach Resort is located in a bushland setting on the beachfront at Rainbow Beach and is on the doorstep of World Heritage Fraser Island. There are apartment and townhouse accommodation styles to choose from, each with a full kitchen, laundry facilities and air-conditioning. Facilities include a lagoon pool, lap pool, restaurant and bar, tennis court and outdoor spa.